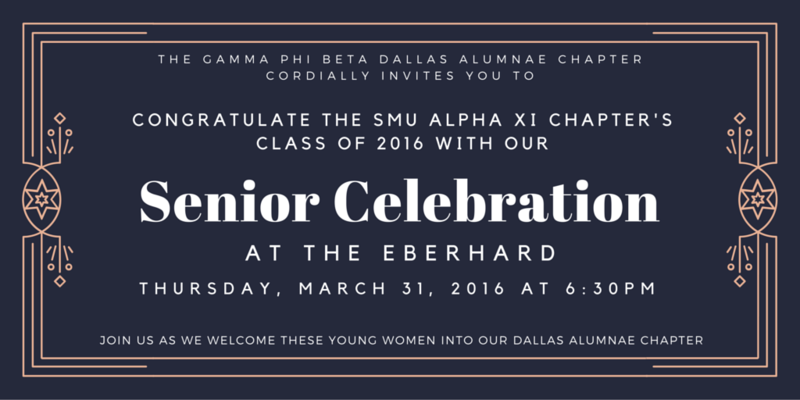 All sisters are welcome to join us on Thursday, March 31, as we honor the 38 graduating Gamma Phi Beta sisters from the Alpha Xi Chapter at SMU. This event will give our current alumnae members the opportunity to network and welcome the graduating seniors into our Dallas Alumnae Chapter. We will also get the opportunity to hear about their time in Gamma Phi at SMU and what their plans are for the future. Appetizers will be provided by the Dallas Alumnae Chapter with a cash bar option. RSVP: Please RSVP by Tuesday, March 29th. Questions? Contact Gloria Steinke for more information. Please RSVP below by Tuesday, March 29th.